Looking for vegetarian recipes? 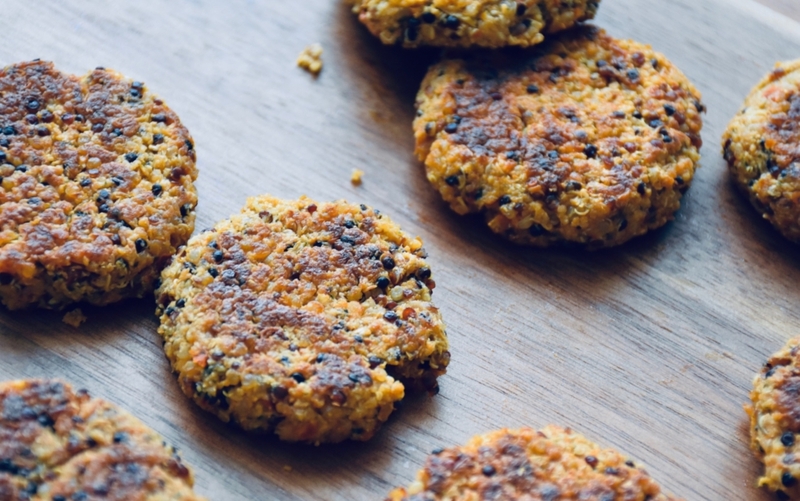 These little Quinoa Veggie Balls are great as appetizer, used on a main dish or for creating delicious veggie burgers. It is also, a good way to have children eat vegetables. In a word, it is a healthy meal, perfect for the whole family. Rinse the quinoa under cold running water. Cook it as it is recommended on the package. I cooked it in a pot with double the amount of salted water, on the medium heat, for about 10-15 minutes (until the white seedling comes off the grain and the liquid is absorbed). Then turned the heat off, closed the pot with the lid and let it rest for the further 5 minutes. Let the quinoa cool down for around 15 minutes. Wash the cauliflower and cut it into florets. Pick and thoroughly wash the rucola leaves. Put the rucola, cauliflower and dried tomatoes into a food processor. Pulse until forming a paste. Pour the paste into a bowl. Add an egg, bread crumbs, quinoa and a pinch of salt and black pepper. Knead well together by hand until the ingredients become compact. Warm the pan with olive oil on medium heat. Fry the veggie balls for about 5-7 minutes on each side. If you serve it as an appetizer, you could add a dipping of yogurt with cucumber and garlic. Let me know in the comments below, how you like this recipe. More recipes you may always find on our FOOD page.